Like many things in my life, self-publishing is a continual process and I keep learning new things as I go. 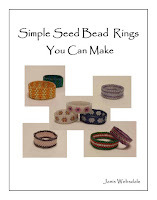 My latest project Simple Seed Bead Rings You Can Make was the biggest and most elaborate that I've taken on yet. It is so big, as a matter of fact, that my "simple" little how-to grew large enough that it required a table of contents. All of my previous patterns were short and sweet, but my ring tutorial gave directions to make 5 different rings, with some of them calling back on previously learnt techniques. With the digital format, it's very simple to create a clickable link in the document that allows the user to go right to the point that you are talking about. For example, I demonstrated how to to add an extra row of beads to a ring. In another design, part of the pattern calls for the reader to ad an extra row. Instead of having to write out the instructions again, I created a bookmark to the instructions I wrote previously and create a link in the document highlighting the words "ad an extra row". Now, if the reader already knows how to do it, great! They can pass by it. But, if they forgot, or haven't done it already, it's easy to find in a simple click. It is very easy to set up bookmarks and a table of contents (ToC as it's called). I found this article posted in the Amazon forums on how to format your book that is sure to help. It is written for those using Word, but if you are like me and don't have this program, not to worry. I found a program called Open Office. It is a free program that you can download from their website. It offers all the same features as Microsoft Word. The bookmark feature that you need to automatically create the links and Table of Contents (ToC), operates in the exact same way. Another very valuable lesson I learnt with my latest project - Shrink your photos! My new tutorial has over 100 photos and when left them in their original size, the document I created was so huge is was almost embarrassing. I recommend that you make your photos no larger than 300 pixels square. The eReaders shrink your photos even further but this size will give you enough to work with and still be manageable. After I realised my photo mistake, I went back to edit and save my photos twice. The first was to crop them to eliminate any extraneous background from the photos, and to save them in a new file. I then shrunk them to be no bigger than 260 pixels wide (just to be safe and to make my document that much more manageable) and saved them AGAIN in another folder marked smalls. I did this for two reasons: the first was to create the ebook. The second is that I want to have my pattern available to users of Amazon Prime, especially for the holidays coming up. For a publisher, this is listed as the KDP Select program and I will let you know how this goes for me. But back to my point. One of the stipulations to have a book in the Amazon Prime program is that it has to be exclusive to Kindle. There can't be a digital copy for sale anywhere else, including Etsy, ArtFire, Barnes and Noble, iTunes, etc. BUT you can still sell hard copies AKA books. 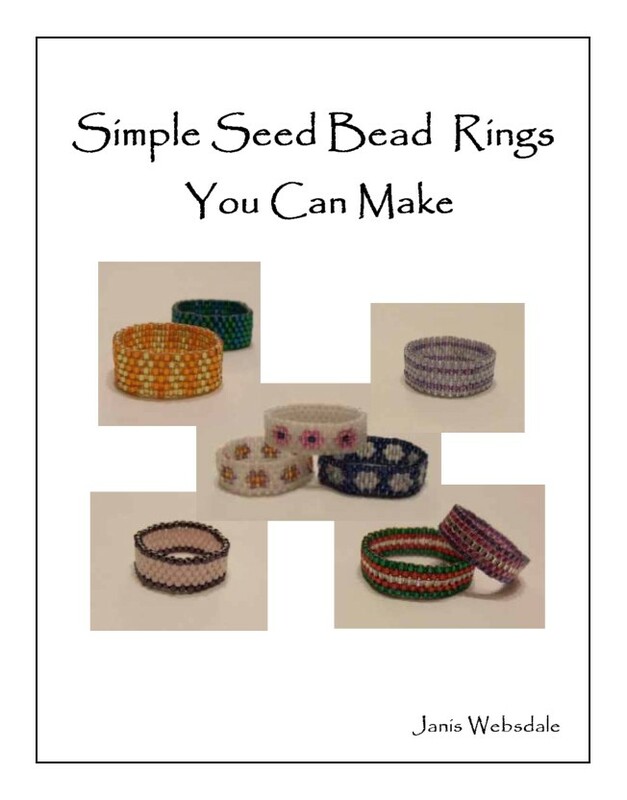 What I plan to do is reformat my ring how-to and then print and sell the booklet. This means I can use larger photos than I did for my ebook and why I save them in two sizes. It's also important to remember, that not all of the readers (i.e. Kobo, Kindle) are in colour. Depending on what your photos show or demonstrate, you may need to take into consideration the contrast between colours when they appear in black and white. I also wanted to give a quick update on how things went with Smashwords. Great news!! I am now officially on most of the devices that are out there because of them! I'm on Barnes and Noble, iTunes and Diesel. I am still not on Kobo. To date have sold 1 copy and looking at my stats at Smashwords, I haven't got a whole lot of paritial downloads either. I guess something is better than nothing. As far as Lulu.com is concerned, they rejected my submitted patterns because they didn't have a table of contents. It would be easy enough to make one, now that I know how, but since I'm already listed on Barnes and Noble and iBookstore, I see no reason to go back to edit them. By far the most successful platform I'm selling on is Kindle. As I stated in Part 1 of my self-publishing adventures, I went directly through this one. As of right now, I usually sell 3-4 patterns a week. Lately, my bracelet how-to has taken off and I sell 1 every few days and sometimes more. I'm not sure if it's because of the upcoming holiday and people want to make gifts or if it's something else. To be honest, the "why" really isn't that important to me. I'm just happy that this is working! To continue on my self-publishing journey, please continue on to Part 3. I think the biggest step is having created this document/how to. It is monumental and a great step in your career. I am going to follow your blog. This article was very informative and maybe I could use this in the future for writing my own how to. I've been wanting to do that for a while but don't really have the knowledge on what to do after writing out the instructions. Thanks so much for this well written post.